Following a painful betrayal, Maddy Monroe’s love life is a wreck, and her restaurant career is in shambles. When her grandmother goes missing, she and her estranged sisters converge at the family beach house in Sea Haven, North Carolina. Being with uptight Nora and free-spirited Emma at the place where their family broke apart is a struggle, and undercurrents of jealousy and resentment threaten to pull the sisters under. In the midst of the storm, sparks begin to fly between Maddy and Gram’s maddening neighbor, Connor Murphy. As the sisters pack up the family belongings, memories of idyllic, slow-paced summers are resurrected. But long-buried secrets also come to light as Maddy discovers that all was not as it appeared that last summer in Sea Haven–nor today in the seemingly perfect lives of her sisters. As family tensions rise and Connor causes tumult in Maddy’s heart, the sisters must find a way to accept each other for the women they’ve become before the bitterness of the past destroys their hope for a future. Summer by the Tides will be available May 21, 2019. 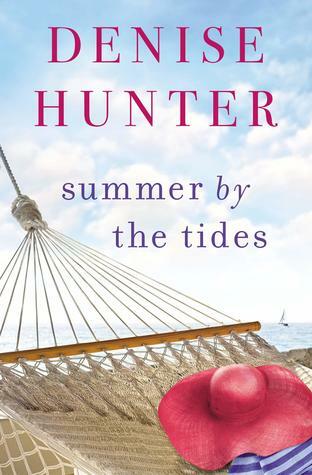 Summer by the Tides is one of my new favorite Denise Hunter novels. A perfect blend of family, faith, and romance, it was everything I hope for when picking up one of Hunter’s books. Maddy loses her job and her boyfriend all at the same time so there is nothing holding her back from going to look in on her grandmother when she gets a call from her concerned neighbor. The concerned neighbor also called Maddy’s two estranged sisters, Nora and Emma. Nora and Emma had a falling out twenty years prior and are both still holding grudges. It makes things really uncomfortable when they all show up at their grandmother’s and then decide to stay there to help fix the place up. All the characters were pretty likable, though sometimes frustrating. The secrets that are discovered during their stay were not anything surprising – except there was an extra twist on one that I wasn’t expecting. I really liked the concerned neighbor, Connor. He was such a sweet and stand-up guy. I loved his relationship with his sisters. I really shipped his growing relationship with Maddy, too. He was exactly the kind of guy that Maddy needed and he was extremely patient with her skittishness. Things did get just a little too cheesy at times when it came to the romance, but I’ll take sappy over graphic any day. Overall, I really enjoyed Summer by the Tides. It was a cute, quick read that I flew right through. I liked the message of faith and trusting in God and felt it was incorporated really well into the characters’ lives and didn’t come off as preachy. I liked seeing Maddy and her sisters work through their issues and discover family secrets. I liked that reconciliation was shown as a process and small steps and not just a magical fix where everything is all of a sudden fine. I definitely recommend this one to Denise Hunter fans. Summer by the Tides sounds uplifting! I’m glad you found a new favorite by this author. Thanks! It was an enjoyable book! And I’m sorry about my missing Funny Friday! I was so sick and out of it last week. I didn’t do much more than lie down in my free time. But things are looking a little better this week! Oh no! That’s horrible! I have to admit I was a little worried about you when it didn’t post. I’m happy you’re feeling better now. I am glad you liked this one! As always I am really looking forward to it 🙂 Hope you are feeling better! Thank you! A little better, though still kind of exhausted. I look forward to hearing what you think about this one. I think you will enjoy it! Happy you enjoyed it! I have read some of Denise Hunter’s books in the past and have this novel in my TBR, looking forward to starting reading asap. Thanks! Denise Hunter is sometimes hit or miss for me, but I definitely enjoyed this one. I hope you enjoy it, as well!